Standard - €38.99 Only 9 left! Park the Bird of Prey and turn on the cloaking device. Because it's time to party like a Klingon! You can party on the Federation homeworld with all of humankind, just leave leave the bat'leth behind and bring plenty of Bloodwine. Because those humans really love to party too! Of course, to go to this shindig, you're going to need just the right party look. 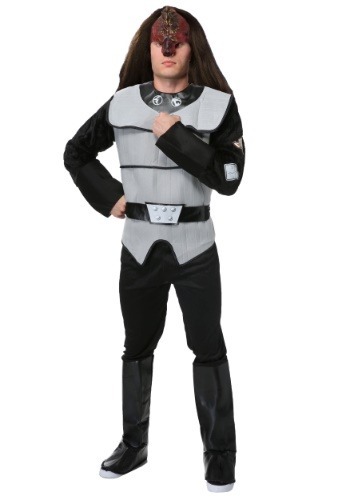 And all you'll need for that is this Deluxe Klingon Costume for men! No matter your species, all you'll have to do to transform yourself into a top Klingon party machine is to pick up this costume. This detailed costume includes a top, pants with attached boot tops, and a belt. The top is styled like the Klingon uniforms worn during Star Trek The Next Generation era, with a vest style armor top, and long sleeves. The furry fleece sleeves have attached logos for a touch of authenticity, and the "armor" has a look that instantly evokes the classic characters from the Klingon homeworld. All you'll need to do to complete the costume look is to use the headpiece to achieve the iconic look of a ridged forehead. The headpiece features a molded vinyl appliance that covers your forehead and sits below your nose. Just trim the nose to fit your face, and use makeup effects of your choosing to complete your costume appearance. Paramount and Star Trek officially licensed, when you use this costume for your next convention or party, we're sure the result is going to be "Qapla!"